The poetry in this book is an outcome of several evolving projects. 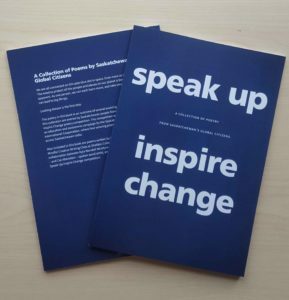 Included in this collection are entries by Saskatchewan people from the 2015 Speak Up, Inspire Change poetry competition. The competition was a part of LookDeeper, an education and awareness campaign by SCIC where four winning poems were recorded and aired across Saskatchewan radio. You can explore all of the poetry entries from across the province, and you can even listen along to the winning poems on the LookDeeper website or SoundCloud. Also included in this book are poems written by high school students in the Mindful Creative Writing Class at Sheldon Collegiate in Regina, Saskatchewan, through an inspiring spin-off project that was made possible by a collaboration between Kyla Wendell McIntyre – a teacher at Sheldon Collegiate – and Cat Abenstein – spoken word artist, and one of the winning poets from the Speak Up Inspire Change competition.